African trypanosomiasis, an aa kent as sleepin sickness, is an insect-borne parasitic disease o humans an ither ainimals. It is caused bi protozoa o the speshies Trypanosoma brucei. 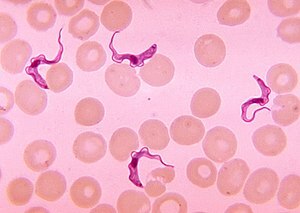 Thare are twa teeps that infect humans, Trypanosoma brucei gambiense (TbG) an Trypanosoma brucei rhodesiense (TbR). TbG causes ower 98% o reportit cases. Bauth are uisually transmittit bi the bite o an infectit tsetse flee an are maist common in rural auries. ↑ 1.0 1.1 1.2 1.3 1.4 1.5 1.6 1.7 1.8 1.9 WHO Media centre (March 2014). "Fact sheet N°259: Trypanosomiasis, Human African (sleeping sickness)". World Health Organization. Archived frae the oreeginal on 26 April 2014. Retrieved 25 April 2014. ↑ 2.0 2.1 2.2 Kennedy, PG (Feb 2013). "Clinical features, diagnosis and treatment of human African trypanosomiasis (sleeping sickness)". Lancet Neurology. 12 (2): 186–94. doi:10.1016/S1474-4422(12)70296-X. PMID 23260189. ↑ GBD 2015 Disease and Injury Incidence and Prevalence, Collaborators. (8 October 2016). "Global, regional, and national incidence, prevalence and years lived with disability for 310 diseases and injuries, 1990-2015: a systematic analysis for the Global Burden of Disease Study 2015". Lancet. 388 (10053): 1545–1602. doi:10.1016/S0140-6736(16)31678-6. PMC 5055577  . PMID 27733282. ↑ GBD 2015 Mortality and Causes of Death, Collaborators. (8 October 2016). "Global, regional, and national life expectancy, all-cause mortality and cause-specific mortality for 249 causes of death, 1980-2015: a systematic analysis for the Global Burden of Disease Study 2015". Lancet. 388 (10053): 1459–1544. doi:10.1016/s0140-6736(16)31012-1. PMC 5388903  . PMID 27733281. This page wis last eeditit on 12 Februar 2018, at 18:08.